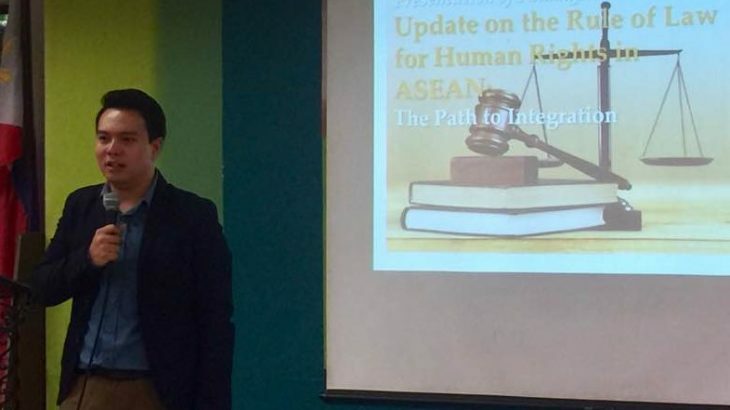 Manila, 8 August 2017 – On the occasion of the 50th anniversary of the founding of the Association of Southeast Asian Nations (ASEAN), the Human Rights Resource Centre (HRRC), through its lead researcher for the “Update on the Rule of Law for Human Rights in ASEAN: The Road to Integration”, Francis Tom Temprosa, presented the study before ASEAN academics, students, government employees, and civil society, highlighting the importance of a shared vision and concept of the rule of law as ASEAN enters its fifth decade. In “ASEAN @ 50”, Mr. Temprosa presented the report’s main findings in a seminar that was organised by the Women and Gender Institute (WAGI) in Miriam College, Philippines. He shared that ASEAN Member States have varying and diverse understandings of the rule of law as a concept. But if ASEAN is to move towards meaningful integration, there is a need for ASEAN to work on strengthening the rule of law. He suggests adopting a reimagined and shared concept of the rule of law — one that builds on a common regional understanding, respect for human rights, and the more dynamic role of local and regional institutions. ASEAN’s diversity is reflected in the variations in the state of rule of law in its Member States, said Mr. Temprosa. Since 2011, the region has exhibited some positive trends, including the hardening of the commitment to rule of law and human rights, as affirmed in the ASEAN Charter and through various ASEAN declarations. He added that the “region’s first treaty,” the ASEAN Convention Against Trafficking in Persons Especially Women and Children (ACTIP), entered into force in February this year. This shows that ASEAN – as a regional bloc – is now more concerned with common human rights issues than before. At the same time, this proves that ASEAN states are more willing to find consensus using shared international commitments as platforms to institutionalise regional responses. The challenge is for ASEAN to continue and foster its vision for the human rights of all through the lens of the rule of law, which was included in the ASEAN Declaration — the ASEAN’s first — in 1967. The rule of law, he added, paved the way for human rights issues to find their place in the conversation between and among ASEAN Member States. However, more needs to be done to fulfil this vision, though ASEAN Member States have had many promising changes in legislation in the last few years. The study, “Update on the Rule of Law for Human Rights in ASEAN: The Road to Integration“, is HRRC’s latest baseline report that analysed policy and legislative changes in the 10 ASEAN Member States since HRRC issued its first baseline report on Rule of Law in 2011. It enumerates the changes in law and policy as found by a group of legal scholars. ASEAN @ 50” was a seminar course that discussed key issues on the three pillars of ASEAN – political, economic and socio-cultural – using a gender lens perspective. It also looked into the challenges and barriers towards ASEAN integration. ACTIP, ASEAN, News, Rule of Law ASEAN@50, Update on Rule of Law. permalink.